Hylo Ocunox Toronto | Scarborough Pharmacy | Kennedy Road I.D.A. 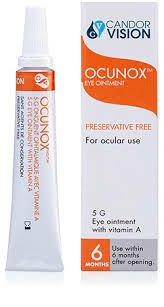 OCUNOX™ eye ointment is entirely free of preservatives and phosphates. Nonetheless, due to its unique formulation, OCUNOX™ eye ointment can be used for up to 6 months after first opening. HYLO™ eye drops contain the sodium salt of hyaluronic acid, a substance found naturally in the eye and other parts of the body. Due to its special physical property, HYLO™ forms a regular, stable, long lasting lubricating film on the eye surface. This film is not easily rinsed off and does not cause blurred vision. HYLO™ provides long-lasting moisture to the surface of the eye to efficaciously support the natural process of healing. Contains 1mg/mL Sodium Hyaluronate, a citrate buffer, sorbitol and water. To improve the lubrication of the eye surface in eyes that are dry, burning or have foreign body sensations due to environmental conditions including after ophthalmo-surgical interventions. For rewetting of contact lenses to minimize dryness. HYLO™Gel was developed for patients with more severe and persistent dry eye, who require more intensive, therapeutic lubrication of the ocular surface. Offers STRONG and long lasting dry eye relief. Provides intensive lubrication of the surface of the eye. Is preservative free and are usually very well tolerated. Is phosphate free, avoiding complications like deposits in the cornea.